GONE FISHING Fairy Sign for Miniature Gypsy Fairy Gardens. Full Description: Gone Fishing! 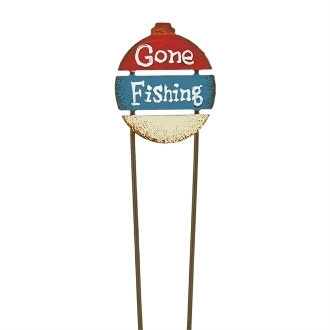 This adorable bobber-shaped sign is a must-have for a lake-themed mini garden. Designed by Genevieve Gail, the sign features all-weather paint and a unique, distressed finish.